The American Quilters Society Quilt Week in Paducah includes hundreds of contest entry quilts on display, as well as special exhibits, merchant malls, workshops, and special events. Wednesday-Friday, 9 AM-5 PM; Saturday, 9 AM-4 PM. Daily, 2-day and multi-day passes are available in advance or at the door. Register online here! Paducah-McCracken County Convention & Expo Center and other Paducah venues. The Convention Center is located at 415 Park Avenue. Visit the AQS Quilt Week website for more info and to register for Spring Quilt Week. Request Paducah’s Quilt Week Events Guide to receive a trip planning brochure by mail before the event. Plan now to attend the 35th annual Spring AQS Quilt Week in Paducah, April 24-27, 2019! Want to spend an afternoon exploring the area when you are in the for show? Find information on the Grand Rivers Quilt Show here, and Area Attractions here. Grand Rivers Quilt Show 2019 Grand Rivers Community Center 155 W Cumberland Ave. Enjoy beautiful new and antique quilts on display at the Grand Rivers Quilt Show. Shop with vendors, and enter the quilt raffle. The show takes place at the Grand Rivers Community Center located at 155 West Cumberland Avenue. The Grand Rivers Quilt Show runs concurrent with the American Quilters Show in Paducah, KY. The show features quilts, wall hanging, and quilt related vendors. Attendees vote to determine winners through the Viewer Choice Awards. Quilt Raffle drawling is at 4PM on Saturday, followed by Awards. A $3.00 donation per person is accepted at the door. Enter a Quilt! Viewers Choice Awards include prize money for First, ,Second and Third Place Quilt and Wall Hanging. Take I-24 KY Exit #31 and follow the signs three miles to Grand Rivers. General Inquires may Call 888-493-0152. Grand Rivers is also home to the award winning Patti’s 1880’s Settlement, and the Badgett Playhouse featuring Variety! Music, Memories and More and other special musical productions throughout the year. The Quilt Show is sponsored by the Grand Rivers Chamber of Commerce. Looking for more spring fun in Grand Rivers? Visit our Attractions Page Here for a full list of area attractions. Visit Fort Smith on the hill above town, explore our lower town and the Civil War history there! 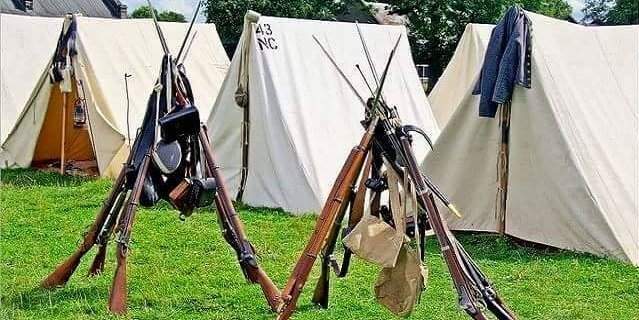 This Civil War Reenactment includes Battle of Smithland, encampment, music, period sutlers, food vendors and more. Reenactors: Your weekend includes Meals (4 meals served! ), Ladies tea, and an Evening social. The weekend also includes Blacksmith, Period sutlers, lemonade pub, and Food Vendor. Firewood and straw is also provided. Reenactors Registration is $5/person or maximum of $15/household. Friday is set-up day for Reenactors. Saturday and Sunday are event days. This is a free event for spectators. Feel free to reach out to the Battle of Smithland Civil War Reenactment with any questions you may have! Find more information on Facebook www.facebook.com/battleofsmithland. 2019 marks the fourth year for this living history event. Smithland, KY is located in Western Kentucky alongside the confluence of the Ohio and Cumberland Rivers. It is the county seat of Livingston County. Make sure and check back for updates. We will print the schedule of events when it is available. Want more Kentucky Lake area events? Visit our Calendar of Events page. 6th Annual Freedom Shoot Charity Bowfishing Tournament for Homes For Our Troops. Details – Registration 3- 5:45 PM at the Lee Jones Center in Eddyville KY. A Mandatory preshoot meeting to follow. Sponsors Include Shooters Supply of Eddyville, AMS Bowfishing, Muzzy Bowfishing, Kentucky Lake Outdoors, Quick Draw Outdoor Gear, Bow String Depot, Lancaster Archery Supply, and Twisted Limb Bowfishing. Back to Main Calendar of Events. The Beatles All-Request Dinner & Show at the Badgett Playhouse. Featuring Terry Mike Jeffrey & Band! Enjoy a catered dinner with all the works by Knoth’s BBQ! Buffet style dinner with 2 meat options, sides, dessert, drinks AND a show!! This one is for the Band! They’ve asked and now you shall receive! Two hours of “The Beatles”, all request music!! Try and “stump” the band! Hear your favorites, and some you may have never heard before. Sure to be an entertaining night with Terry Mike and the “guys”. Shows at the Badgett Theatre in Grand Rivers rival anything you can find in Branson. High-caliber talent, music and performances right here in West Kentucky! The Playhouse is a 6,000-square-foot facility located on JH O’Bryan in Grand Rivers. It features state-of-the-art sound and lighting (including moving light fixtures), and more than 15 exciting shows per year! Reserve seating. Visit the Badgett Playhouse Website for the complete show schedule and online ticket sales or call the Badgett Playhouse Box office at 888-362-4223. Matinee performances are 2pm, and Evening shows are 7pm. Many show dates do sell out. Want to make it a part of your vacation plans? Check out our Attractions Page for more fun things to do and check out our Lodging Page for hotels and resorts.